i was on spring break for the last week. it started with one of my high school friends visiting me in socal (did i pick her up at midnight from the airport even though i had an 8am final the next day? maybe), and then i flew to florida to hang out with my favorite mouse for a few days. follow along on my instagram stories– i’m posting about disney world this weekend and next! and i’ll post a recap when i get around to editing all of the pics. do i deserve one of these caramelized white chocolate cupcakes with strawberry buttercream? not really, given all the gluttony my body went through over break. but maybe you do, so in that case, hi. these cupcakes originally started out as a cake, but it took forever to caramelize the white chocolate in the oven + i couldn’t really taste the white chocolate. boo. so in this version, i caramelized it on the stove, and it shaved off at least 30 minutes of babysitting!! yay. if you don’t want to deal (which i urge you against), you can ignore the caramelized white chocolate and 1) use plain white chocolate chips and/or 2) swirl more caramel into the cake batter. also, i used a wilton 32 tip to make a rose like topping on the cupcakes, but you can just plop some buttercream on top. and they’re forgiving. they’ll still turn out if you soften your butter too much in the microwave and then freeze it in your attempt to re-solidify it. the cake will still rise and be fluffy and delicious if you mix the eggs with the butter too early. 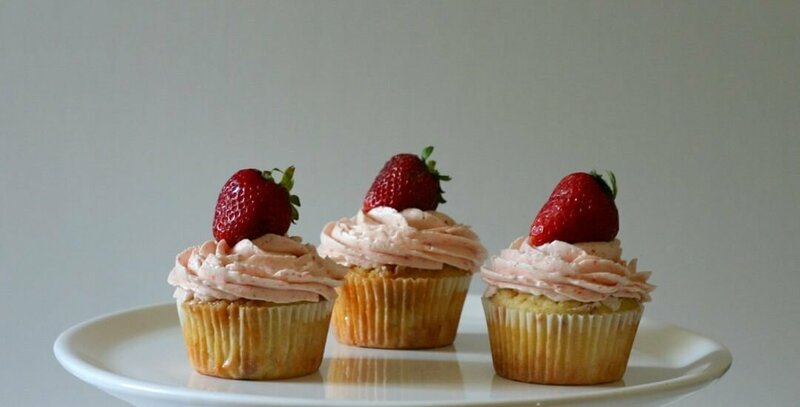 so how do these caramelized white chocolate cupcakes with strawberry buttercream taste? there’s a gentle caramel flavor from both the caramelized white chocolate (it tastes nothing like plain white chocolate! highly recommend playing around with it if you haven’t yet) and caramel swirled in. 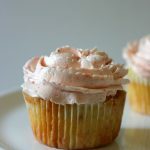 the strawberry buttercream is super silky, and the sweet/tart notes balance out the butterscotch-rich cake oh so nicely. i’m craving one now, even if i need to treat my body like a temple between now and my next adventure (big bear, here i come!). These caramelized white chocolate cupcakes with strawberry buttercream get a double dose of caramelly flavor, from the caramelized white chocolate and a bit of caramel swirled into the cake batter before the cupcakes get baked. In a nonstick skillet over medium-low heat, add the chocolate. Stir frequently with a heatproof spatula, until the chocolate darkens to a caramelly, toffee-y color. This will take about 15 minutes. You can turn the heat up, but you will have to watch it much more closely. Don’t worry if it seizes up and becomes crumbly; it’s a good thing! Cool completely, then break up any big chunks. On low speed, alternately add the flour and milk, in three additions, beginning and ending with the flour. Stir in the chocolate. Fill 12 lined muffin cups. 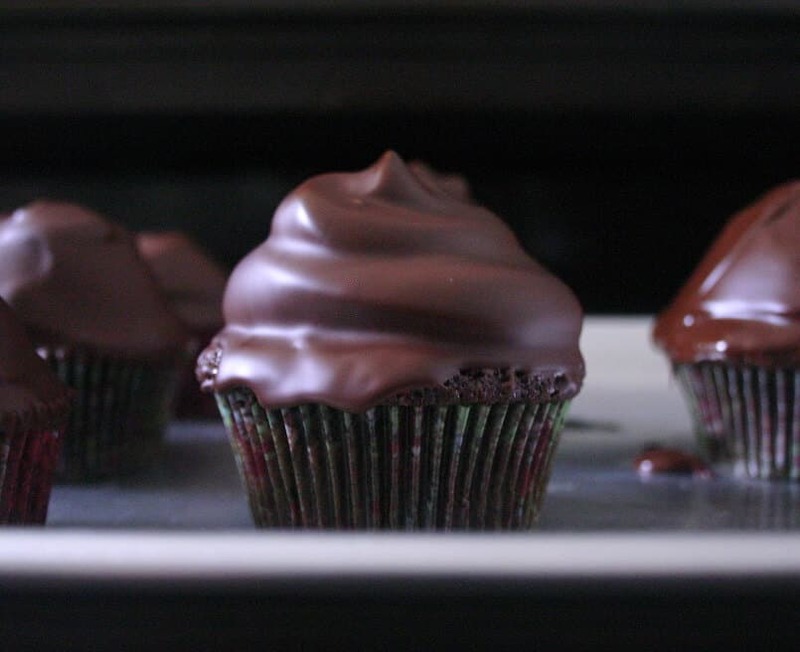 Using a skewer or knife, thoroughly swirl 1 tsp caramel into each cupcake. Bake at 350F for 17 -20 minutes or a toothpick comes out clean. Cool on a wire rack. Frost cooled cupcakes. In the heatproof bowl set over a pan of simmering water, combine the egg whites and sugar. Cook, whisking constantly, until the sugar has dissolved and mixture is warm to the touch. Attach the bowl to the mixer fitted with the whisk attachment. Beat until the meringue holds stiff (but not dry) peaks, and the bowl is room temperature. Switch to the paddle attachment. Add the butter several tablespoons at a time, beating well after each addition. Beat in the vanilla and strawberries. Cake adapted from Joy of Baking, buttercream from Martha Stewart’s Baking Handbook. You can spread out the white chocolate on a lined baking sheet and caramelize it in the oven at 250F for 45ish minutes, stirring occasionally. It requires less attention than stovetop, but takes longer. Normally you don't want your chocolate to seize when you caramelize it, but in this case, the chunks make it easier to stir into the batter. To make these easier: don't caramelize the white chocolate, or omit it all together (and maybe swirl more caramel into the cake batter). 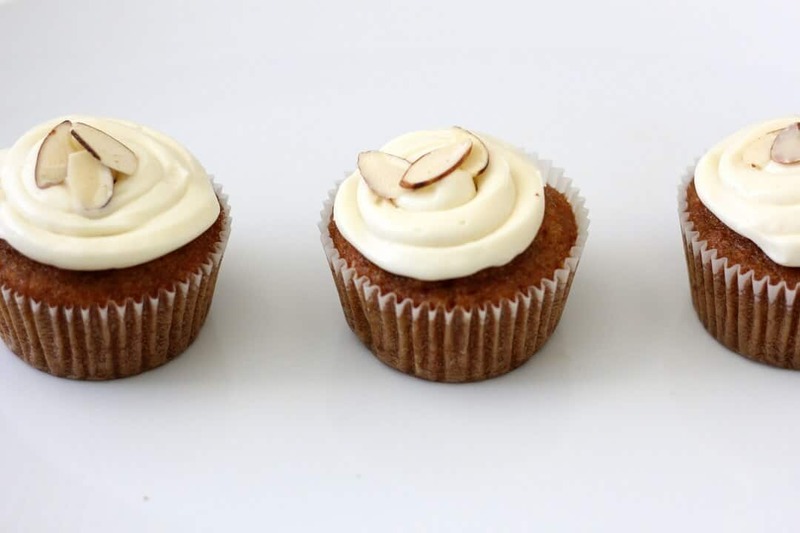 If you're not serving these on the day that you bake the cupcakes, store them at room temperature in an airtight container so that they don't dry out. 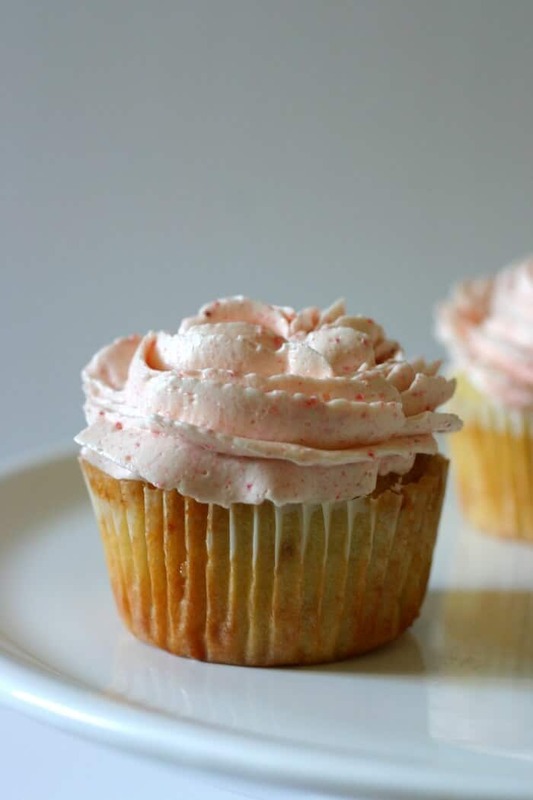 This strawberry buttercream recipe makes a very modest amount of frosting. Feel free to double it if you like your cupcakes well frosted. Ahhh love DisneyWorld!!! Can’t wait to see your photos! But these cupcakes look heavenly! Never thought to caramelize white chocolate! Brilliant idea!! Thank you for sharing 💓. ooh i hope you try it out sometime! it’s sososo good. You’re a gem for going out of your way for your friend! Especially when you have finals coming up the morning after! Hope you had fun at Disney World! Yum! You always come up with the best recipes! You’re not kidding about this being a real dessert! i made her help me wake up (i was actually concerned about missing that final – i slept through my alarm and missed a midterm once whoops), so it was all good (; and disney world was amazing! disneyland >>>> though. disney is so fun! and i love that they’re always doing something new. they’re launching pixar fest at disneyland, and i’m hoping i’ll end up there somehow during it! Oh HELLOOOOO WHITE CHOCOLATE! hahahaha! We are totally on the same page here! 😉 These cupcakes are absolute beauties and I think they might be better as cupcakes vs. cakes cause… I mean, PORTION CONTROL! lol! I’m so jealous of your spring break, and these cupcakes look amazing!!! Love the idea of caramelized white chocolate…I’ve never tried it! Yum! Omg… caramelized white chocolate sounds delicious! I don’t think I ever had that before. Plus, that strawberry buttercream looks so good. I would probably eat half of it before frosting the cupcakes. Oh wow! I didn’t know caramelized white chocolate was a thing! This cupcake is a beauty, and I love the fluffy strawberry speckled buttercream. Have fun in Big Bear!! it is a thing!! hope you try it out soon (: and big bear was fun! it’s definitely more of a winter town, but there’s still a cute village and a lake to walk around. I can’t wait to get back to Disney World! Looking forward to your blog post recapping your trip! In the meantime, these cupcakes look outstanding! Loving that strawberry buttercream!! when you do, go to animal kingdom and tell me how pandora is!!! i missed it on this trip, but it sounds amazing. Whelp, my mind is blown. I’ve never heard of caramelizing white chocolate before! I’m not a fan of white chocolate so altering its taste sounds great to me. Oh man, do caramelized white hot chocolates exists? If caramelized white chocolate tastes a bit caramel-y, can you imagine it in hot chocolate form? Anyway, your cupcakes look amazingly delicious (jeez, I sound like a cereal commercial or something). AHHH CARAMELIZED WHITE HOT CHOCOLATE SOUNDS SO GOOD. looking forward to your post about it!! (; oh my, i’ll be dreaming about that one for a while. I am quite bad in baking. It may be because I don’t have that confidence. I make me happy to see that how wonderfully you guys can bake and get the great results. I love these cupcakes. It is moist and looks delectable. Thumbs up for this recipe. yes, I will catch you on Instagram soon. Can this be made into a layer cake instead? If so, any tips on doing so? Thanks!